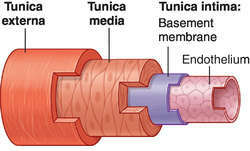 origin, brachial; course, accompanies radial nerve in radial groove on posterior aspect of humerus; distribution, humerus and muscles and integument of arm; anastomoses, posterior circumflex humeral, radial recurrent, recurrent interosseous, ulnar collateral, that is, articular vascular network of elbow. 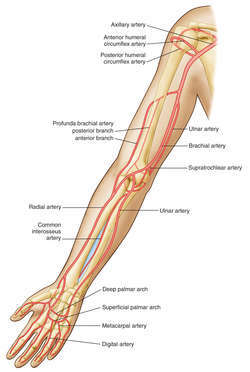 a branch of each of the brachial arteries, arising at the distal border of the teres major, passing deeply into the arm between the long and lateral heads of the triceps brachii, and supplying the humerus and muscles of the upper arm. 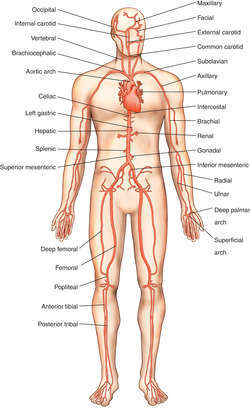 It has five branches: ascending, radial collateral, middle collateral, muscular, and nutrient. 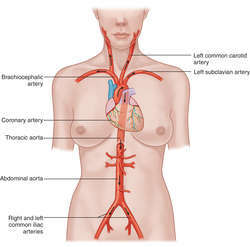 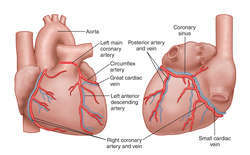 Also called superior profunda artery.